Shane Galloway of Benton County Natural Areas & Parks coordinated the Hyak Park project. Benton County’s Hyak Park on the Willamette River reopened to the public Wednesday after being closed while workers were installing a small new restroom building. I noticed the “park closed” barriers while driving past on Tuesday. When I went by on Wednesday to check what was going on, park ranger Shane Galloway and lead park ranger Bruce Baillie of the county parks department were just taking down the barriers and the sign. 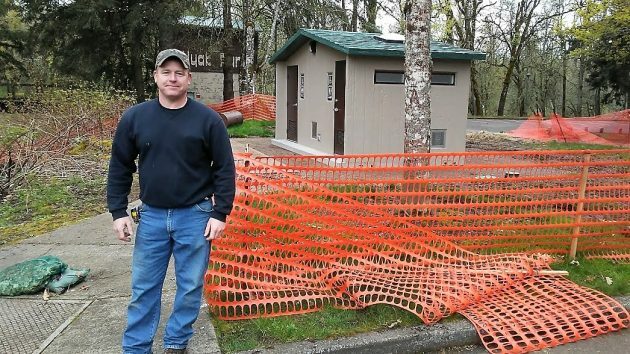 Thanks to a grant from the Oregon State Marine Board that paid half the cost, the county was able to install a new restroom building at the popular park. The old one, in Baillie’s words, was worn out. The work was more complicated than usual because according to FEMA, the federal emergency agency, the floodplain of the Willamette reaches as high as 4 and a half feet up the walls of the restroom. The biggest flood in recent years, in January 1996, didn’t come close to that level. But because of what it says on FEMA maps, the Hyak restroom had to be built accordingly. The electrical panel is high up on the wall in order to remain above the maximum expected flood level. The plumbing, too, had to be done in a special way. Laurie Starha, director of Benton County Natural Areas & Parks, told me the Marine Board grant to replace the old restroom was for $53,000. Construction started March 5 and will continue until the end of May. Galloway told me that the Marine Board was great to work with and deserves much credit for this improvement at the riverside park. The park is a popular designation for canoe trips down the river from Corvallis, and an easy launching spot for voyages downstream toward Albany’s Takena and Bowman parks and beyond. Hasso, you are a One-Man Wrecking Crew where Albany News gathering is concerned. Lee Enterprises should put you on retainer. One longs for the days when Hering would pen three or four “Opinion-Torials” on the pages of the now-so-boring Albany Democrat Herald, all the while managing a Newsroom filled with a coterie of oddballs and outcasts. Hering makes the current Democrat-Herald editorial staff look like a bunch of stiffs. I enjoy the blog as well, Hasso. Hasso, as one of those former “oddballs and outcasts,” I appreciate you providing a valuable and entertaining supplement to the DH and GT, which are for all intents and purposes the same paper these days (I wonder how people in Corvallis like reading about Sweet Home, and vice versa). Anyway, keep up the good work!